Then he penned a ditty about Peter "Ice Pellets" Jenkins but his publisher gave him the cold shoulder. The tune Robbie "Rainy Season" Jones was a washout. And an attempt to set music to Dan "Dust Storm" Dandy was simply swept aside. He came really close with Tony "Tornado" and Dawn but something like that had already been done. Then one day he was eating a rueben sandwich at Carter's Restaurant on the south side of Chicago with Jim Croce who was trying to spit into the wind and the rest is musical history! And thankfully that song turned out ok. It was a much bigger hit than the b-side, written about the struggles of Steve "Kind of a Sleet Thing" Stevenson. Simple Dude: That song is so obscure I think it may only be available on bootlegs. I wish somebody would name a song after me. "Sandie, baby, I'm in misery"
Then the hotdog jumps into the bun. Is it "Touch Me Babe" that ends on the same four-note punch as the old Ajax jingle? I know it's one of The Doors songs that seems to end "stronger than dirt"... I just can't recall which. Quirks: I'm kinda partial to "look at me, I'm Sandra Dee". And as for the hot dog, I said that somewhere. I think it was at the drive-in. Cdn. Blend: You got it in one, sir. Maybe he could do a song about Christine "Dense Fog" O'Donnell? 00dozo: Yeah, or maybe Mel "The Velvet Fog" Torme! 00dozo: I wonder if Dense Fog would affect The Velvet Fog's voice? I was thinking of a song about Shawn "Cloudy tonight with a chance of flurries. Scattered snow on Tuesday with a high of -9. Winds westerly at 20km/hour. It's currently -3 degrees and snowing." Ohara. Shawn: I tried googling it and just couldn't find it. Imagine having a nickname longer than your right arm! dufus: Hmmm...I don't know - they may both get lost in Foggy Bottom. 00dozo: Then they'd be the Foggy Bottom Boys! Oh, yeah. That's Soggy Bottom Boys. Well. either way, I think they'd hit bottom. Dufus, this lost me so completely I am going out to do yard work. Thanks. Heheheh! Loved Bob "Hail The Size of Golf Balls" Bryant! Yes? And then what? Please don't leave us dangling like Bob! Nicky: hahaha, love it. Maybe you could explain things to Linda. Finish the story? Well, that was informative. I Googled Carter to find out more and now I want to see the movie about Hurricane. (As well as track down the Dylan song.) See... you're always teaching me something new, Dufus! Boom Boom: Just when I thought you knew it all, Boom Boom. In all seriousness it's a fascinating story. Nice history here, both thorough and accurate. 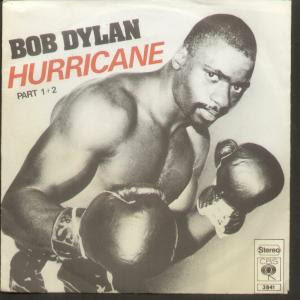 Curiously, though, you failed to mention where Dylan got his inspiration for his biggest hit, "Blowin' in the Wind." In the early 60s, as a young man, he was down in Times Square in March and saw something that gave him the idea for song title. The rest of it came to him rather quickly after that. This was before the mayor cleaned up Times Square, of course. Mike: That's odd. I knew he got the inspiration in New York City. But I thought it was based on the after effects of a three-bean salad and cabbage roll dinner at Suze Rotolo's place. Huh. MikeWJ: that'd have to be one gale force wind. KABLOOEY: Eh? Oh, sorry. don't let me interrupt you and Mike.